Discussion in 'Entity Component System and C# Job system' started by PhilSA, May 16, 2018. ECSPhysics aims to be a complete publicly-available 3D physics engine made entirely in Pure ECS for Unity. trojanfoe123, siggigg, AdamGoodrich and 9 others like this. I would imagine yes to all but the source code, because it is PhysX and therefore owned by nvidia. EDIT: P.S I am also starting to do this for an RTS and would like to maybe have a catch up on how you get on in a while! I doubt it will be in the next two years, but at the moment it looks like they want to push everything to pure ecs. I seriously doubt any source would be available for that. A C# based physics engine with source for pure ECS, with the aim of brute force simple readable code, is something we want to build. We don't have a plan for GPU based physics. It would be great to see what you come up with though. Keep us up to date here. _xAtMa44x_, LazyMonkey, hellowill89 and 7 others like this. BroadphaseSystem: For each collider, do an AABB test against all the other colliders, and output a NativeArray<CollisionPair> representing all the pairs of colliders that are potentially overlapping. There is a good reason why ContactsGenerationSystem and ContactsResolutionSystem are two separate steps; it's because we sometimes need to be able to do some logic after contact manifolds have been generated, but before the collision is actually solved. Think about a situation where you are making character controllers and want to have complete control over how the character decollides from colliders. A common case is when your character lands on a slope after a jump. Normally, it'll decollide diagonally because of the angle, so your character will "drift" down the slope a little bit. What you'd really want in that case is to solve collisions 100% vertically instead. You can now add a system between these two that will modify the contact manifolds of your character rigidbodies before they are actually processed and resolved. This is something that we cannot do in current unity physics! asdzxcv777, jdcampbe, Antypodish and 26 others like this. If you make this open source, I would love to contribute. I'm pretty sure other people would as well. HonorableDaniel, Enrico-Monese, GameDevCouple_I and 2 others like this. Jojoman, GameDevCouple_I and starikcetin like this. I second what @starikcetin said. I've once implemented a very rudimentary n-body 2D physics for a space shooter game, but I did have a lot of the physics engine take over on what I did. Looking at your design you haven't catered for the different possible layers yet? GameDevCouple_I and starikcetin like this. I would love what Unity's team has to say about that, if we should do it or not, or if they will add some API to support this in a good way. Pretty nice start. There is gonna be a huge improvement by using a spatial partitioning (like the boid ECS sample) to only check nearby colliders but also a flag IsMoving to avoid looping on inactive colliders, ECS will be perfect for that use case. I've got about 200k particles checking each 1k triangles, 40 capsule and 5 sphere colliders at 1.7ms. I've got the same problem here, without partitioning it won't scale well and making that data structure on the GPU won't be trivial. DMeville, trojanfoe123, jdcampbe and 5 others like this. Gonna use octree for collision partitioning? I'm in the middle of implementing my BVH construction in the broadphase, and I came across a very interesting metric. IsDon, jdcampbe, optimise and 5 others like this. We're in for a hell of a ride once all the burst technology gets stable and onto all the consoles / high-end mobiles. In regards to events our plan is to use components as events. You can use EntityCommandBuffer to add components from jobs and apply them later in the frame. Currently its not optimal in terms of performance, but we will make a fast path for add / remove components for components that get added and removed temporarily. tbriley, optimise, Djayp and 3 others like this. The playerloop integration code simply calls the public void Update(); method so ts not gonna have any perf downsides. That said, we definitely want to support making systems properly hierarchical. For the same reason of being able to update a single system and it running all sub-systems. @PhilSA have you thought of putting this on Github yet? I'm really keen to see what this looks like. avvie and GameDevCouple_I like this. jdcampbe, avvie, Zoey_O and 5 others like this. Looking forward to seeing that, quite impressive work so far! Been thinking about playing with a crude physics implementation myself. I think with the ECS+Burst approach a realtime simple fluid system should be feasible. It's funny though how often that "I just want to get a few things cleaned up" stop people from releasing code publicly, I myself am guilty of that so many times It can be quite scary to release code for public scrutiny. We actually have some experiments on-going regarding the opportunities brought by ECS and the C# job system. Unity's physics team is watching this forum space closely, too. Speaking of the GPU physics, this is probably a little separate isn't it? One of the major blockers historically was the fact of absence of GPU budget for physics in a lot of games, and a separate observation that it's often rather expensive to circulate data between CPU/GPU. All of the game logic is driven by CPU naturally, so the pressure is real. Personally, I've mostly seen successful GPU physics usage in demos and research projects exclusively. There, the usage was mostly about constructing something and letting it simulate/collapse/explode. Throw shapes in and observe. However, I wanted to mention that PhysX has GPU physics option since PhysX 3.4. We might roll out an experimental build with it later this year in case a bunch of interested devs would volunteer to try it out. With PhysX, it's pretty much a single toggle to enable that. Lars-Steenhoff, laurentlavigne, optimise and 4 others like this. I mentioned GPU physics specifically because of @PhilSA mentioning in the OP about using GPU compute as much as possible. The points you raise about GPU vs CPU physics are valid and interesting ones however! Honestly though, just a physics system that leverages ECS and Jobs would likely be enough for everyone. I have made some developments in re-implementing NVidia Flex, which is a unified particles approach, using ComputeShaders and/or JobSystem with Burst. Got all the main algorithms working but not optimized well. The whole engine seems rather compact in terms of code but the guys at NVidia sure did spent a lot of time to fine-tune it for the GPUs (async compute, data sorting for coherent memory accesses etc). I try to not derail this discussion further, just wanted to add note that PhysX 3.4 GPU mode is still limited to Nvidia GPUs (and only works on Kepler+). More info about it here: https://docs.nvidia.com/gameworks/content/gameworkslibrary/physx/guide/Manual/GPURigidBodies.html or just watch the GDC talk here: http://www.gdcvault.com/play/1024345/. Sorry again for offtopic, just wanted to inform people about GPU vendor limitation which can be a deal breaker for many if planning to release a game using this tech. This also obviously limits the platforms to PC space as well. Thanks for the info good to know! And I've got some nice results as shown in this video! I think we'll be able to do physics queries (raycasts, overlaps, etc...) from inside jobs. Unless I'm mistaken, all we need to do to allow this is that whenever we want to do queries inside jobs, we just have to pass to that job the various NativeArrays containing the physics world information (such as the BVH nodes array, the colliders arrays, etc...). This is different from the RaycastCommand already available in Unity, because RaycastCommand is an independant job, and can't actually be used inside another job. xVergilx, DwinTeimlon, mike_acton and 2 others like this. xVergilx, FROS7, S_Darkwell and 1 other person like this. Nice work. Hopefully this gets some traction. I hate using third party libraries when it's a one of a kind type thing, because you never really know how good or bad it is until it actually gets some real competition. There were some competitors like Bullet/Havoc, but I think they are mostly dead now as far as any real new work into them. PhilSA and siggigg like this. If you don't need to simulate thousands of rigidbodies at once (consider implementing sleep functionality), I still think running physics in double precision is the way to go, this is also what KSP did for bigger scale things. The upsides for using doubles for all physics is that it eliminates single precision floating point accuracy issues while keeping the solvers simple. You don't need to keep shifting every rigidbody/collider around on the physics side, you simply do same things as before and only shift the unity side of things (handle origin rebasing for unity's visuals and transforms alone but physics system itself wouldn't need to be aware of it at all). Additionally, you can't easily do large scale multiplayer with floating point shifting approach for physics as your server will need to simulate the physics on the whole world at once (unless you really can limit all the players into small segment of the world at once). I can think of some approaches where you could solve the server issue on floats (divide the whole world in chunks and let server sim each chunk independently and then sync and somehow deal with the inconsistencies on the tile borders) but it all adds complexity and does compromises for the simulation quality (in my example, you'd want to keep the chunks/tiles as big as possible, which leads to lower accuracy near the tile border). The downside from using doubles is that you get weaker SIMD gains (with SSE2, you can only do double math 2-wide where in floats you can do 4, with AVX you can do doubles 4-wide but floats could go 8-wide. I don't know if Burst really puts much 8-wide, so if the target can do AVX, the perf loss from SIMD probably wouldn't be that bad, although doubles SIMD instruction counts are probably tad higher as well). Other downside is that you'll get twice the data in cache so you are more prone to get cache misses. But the main issue with doubles approach atm is that Unity's new math lib simply doesn't support doubles for anything, not for basic math, not for vectors not for quaternions. Since Burst relies heavily on that math lib, you are likely to lose most of the SIMD gains right away. If Math lib/Burst had full double support, I probably would have already done my own jobified physics solver in Unity (I've done simple double precision solver for Unreal in past). Unity has listed lack of doubles as a known issue on Math libs readme so there are chances that they'll add it some day but it's not a huge priority to them. edit/disclaimer: everything I wrote was only with PC platform in mind, I have zero clue what kind of SIMD operations are available for mobiles / I've never done any mobile dev. Antypodish, PhilSA and korzen303 like this. Dividing the world into chunks is relatively straight forward. I actually prefer to do it in small chunks, like 1k units wide. I actually encapsulate the entire thing right into my equivalents of Vector3/Vector2. So ToPoint3D is an extension that takes a cell id. Plus another extension method that doesn't and pulls the current cell id from a static when using it client side. So on both sides translation is completely transparent to feature code. And how many games are there that have huge open worlds that are FPS type games that even benefit from synchronized physics movement? I don't' know of any major mmo that uses synchronized physics for movement. And even in that case, latency means some of your clients are just seeing the wrong thing anyways. Fudging for coordinate translation precision loss I don't think would be a big hurdle. Wow! You've achieved so much so quickly. I was expecting many weeks before hearing about progress like this! Have a similar concept to isKinematic? Allow non-axis aligned box colliders? Allow box colliders without uniform scale? If / once all of the above are true, it could very well serve all of my needs for my current project. Even if it does not, I can't wait to begin experimenting with it! Also, reading over prior comments and considering the ECS approach, I'm wondering if it wouldn't be (relatively) simple to make features toggleable. For example, as @rizu mentioned, double precision would be fantastic for those who could afford the performance cost. I'd also be ecstatic to see a choice of friction models. I'd also love to add additional collision primitives to my wish list. 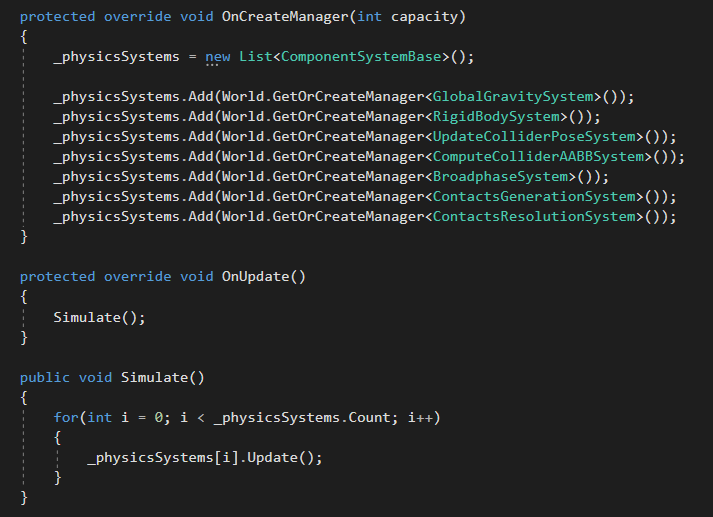 The lack of a cylinder collider in Unity's PhysX implementation has often challenged me. I'm certain that a Cone collider would also be put to great use! As always, thank you for your amazing efforts, Phil! Maybe they'll be 4 separate component types; and maybe they'll just be an enum on a general-purpose rigidbody component. Unlike current unity physics, colliders that are just sitting around with no rigidbody or trigger component attached will be completely useless. Unfortunately, there's no support for doubles on the Math lib itself, so you'd have to basically copy/paste the existing math libs needed parts into double format or modify the stock math lib (but this wouldn't be easy to ship in github). Obvious downside of this is that you'll lose almost all Burst optimizations right away, so I can imagine this will not be a thing you'd want to have today but more of thing in the future if Unity will support double types (they are not that slow if Unity adds Math lib, Burst and AVX support for them as you can then do doubles 4-wide). It would work even now without Burst optimizations if you handle the double math yourself (or copy stuff from math lib and mod it to use doubles) but perf difference will be noticeable. It is a shame they did not consider determinism with the new mathematics library. I'm pretty sure they did. What makes you say that? It's a bit fuzzy now but I know there is a thread around here somewhere where they addressed that specifically. Doesn't the new mathammathe library use floats? If PhilSA wanted to make his engine deterministic wouldn't he have to use his own math library and such? Alas, I have no thoughts on multiple components versus a general component for the different types of Rigidbodies. I'll be interested in seeing your decision, and hearing your logic (if you're willing to share). Including double variants of relevant components and systems would be excellent. I imagine it would be a fairly simple conversion, perhaps switching between double/single precision variants via a preprocessor condition? Of course, that’s of less importance than establishing the primary features, and if it really is that easy, it shouldn’t be difficult for users to implement themselves. Regarding double precision support in the Unity.Mathematics library—Unity has stated that double precision is on their roadmap. For the meantime, I've attached scripts that add double support to Unity.Mathematics. To use it, simply extract, then copy and paste the scripts into the relevant packages folder (eg: C:\Users\[USERNAME]\AppData\Local\Unity\cache\packages\staging-packages.unity.com\com.unity.mathematics@0.0.12-preview.5). The double scripts are modified versions of Unity.Mathematics scripts. I replaced types and literals with doubles where applicable, and updated constant values to take advantage of the increased precision. While reasonable care was taken while modifying them, but there's no guarantee that a few float values didn't slip through. Additionally, I made what I hope was a reasonable guess as to an appropriate value for "epsilon_normalD" in d_mathextended.cs, but I'm not certain, as I wasn’t able to determine exactly why they decided on the equivalent value in the original script. Regarding calculation of cylinder primitives, I'm surprised to hear that it's so expensive. Is it more difficult than simulating a box with an additional axis distance check on two axes? Or is that in and of itself an expensive proposition? Of course, I realize that nearly all tasks are more challenging than they first appear. Please realize that I only inquire because I'm interested, not in an attempt to affect your focus/approach in any way. As always, thank you! Be well! Antypodish, Kender, PhilSA and 1 other person like this. Regarding double precision support in the Unity.Mathematics library—Unity has stated that double precision is in their roadmap. For the meantime, I've attached scripts that adds double support to the Unity.Mathematics. To use it, simply extract, then copy and paste the scripts into the relevant packages folder (eg: C:\Users\[USERNAME]\AppData\Local\Unity\cache\packages\staging-packages.unity.com\com.unity.mathematics@0.0.12-preview.5). While working on implementing friction and bounce, I discovered something pretty cool: my system is actually 2x more performant than I thought it was... because all of my systems were actually running twice per frame by mistake! keeponshading, racer161, IsDon and 24 others like this.